1. 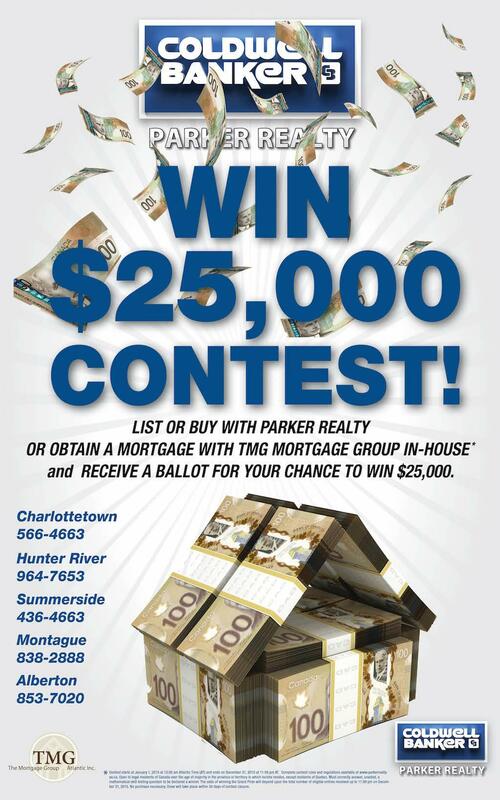 Eligibility:The Contest is open to all legal residents of Canada (except Quebec) who have reached the age of majority in their province/territory of residence at the time of entry, except employees, agents, contractors or immediate family members of Parker Realty Ltd. or Lori MacDonald, Hilary Woodford and Andrew Matheson (collectively, the "Sponsor"). 2. Contest Entry Period: Contest Entry Period begins on January 1, 2015 at 12:00 am Atlantic Time (AT) and ends on December 31, 2015 at 11:59 pm AT (the "Contest Entry Period"). • d. Send a five hundred (500) word (or more) essay to Parker Realty Ltd. describing why Parker Realty Ltd. is the best real estate agency in Prince Edward Island (the “Essay”) and send it, along with your first name, last name, email address, mailing address, telephone number and age (the “Essay Entry”). The withdrawal of a listing prior to the end of the Contest Entry Period shall result in the removal of the vendor’s ballot from the Contest. An agreement to take a listing is at the sole discretion of Parker Realty Ltd. There is a limit of one (1) Entry per property listing, property purchase or property number permitted, and a limit of one Essay Entry per household (civic address), during the Contest Entry Period. For greater certainty, persons purchasing or selling a property together will not receive one Entry each, but rather will receive one Entry between or among them. One Entry per listing and not per Property Identification Number (“PID”); therefore, if multiple PIDs are listed together as one listing for sale, the sale will result in one (1) Entry. 4. Entry Requirements and Conditions: Any Essay submitted must be in accordance with the specific requirements listed below and should depict, describe and/or discuss why Parker Realty Ltd. is the best real estate agency in Prince Edward Island. Your Essay Entry must be an original Essay. Essay Entries will be ineligible for entry in the Contest if: (a) the information listed in paragraph 4(d) is not complete or included; and/or (b) if the Essay does not conform to these Rules. Parker Realty Ltd. is not responsible for late, lost, misdirected, delayed, incomplete or incompatible entries. •vi. is not defamatory, trade libelous, pornographic or obscene, and further that it will not contain, depict, include, discuss or involve, without limitation, any of the following: explicit, graphic or excessive sexual activity; crude, vulgar or offensive language and/or symbols; derogatory characterizations of any ethnic, racial, sexual or religious groups; content that endorses, condones and/or discusses any illegal, inappropriate or risky activity, behaviour or conduct; personal information of individuals, including, without limitation, names and addresses (physical or electronic); conduct or other activities in violation of these rules; commercial messages, comparisons or solicitations for products or services other than those of Parker Realty Ltd.; any identifiable third party products and/or trade-marks, brands or logos, other than those of Parker Realty Ltd.
By entering the Contest and submitting an entry, each entrant: (i) grants to Parker Realty Ltd., in perpetuity, a non-exclusive right and license to publish, display, reproduce, modify, edit or otherwise use the Essay, in whole or in part, for advertising or promoting the Contest or for any other reason, and without any compensation from Parker Realty; (ii) waives all moral rights in and to his/her Essay in favour of Parker Realty Ltd.; and (iii) agrees to release and hold harmless Parker Realty Ltd. from and against any and all claims based on publicity rights, defamation, invasion of privacy, copyright infringement, trade-mark infringement or any other intellectual property related cause of action. For greater certainty, Parker Realty Ltd. reserves the right, in its sole discretion, to modify, edit or remove any Essay, or to request an entrant to modify or edit his or her Essay, if a complaint is received with respect to the Essay, or for any other reason. Parker Realty Ltd. shall be held harmless by all entrants in the event it is subsequently discovered that an entrant has not fully complied with any of the Rules. 5. Use of Personal Information and Privacy: All entries become property of Sponsor. Sponsor reserves the right to use any and all information related to the Contest, including submissions provided by entrants, for editorial, marketing and any other purpose, unless prohibited by law. Any Essay that is deemed appropriate may be posted on the website of Parker Realty Ltd.
Each entrant grants permission for Sponsor and its designees to use his/her name, address (city and province/territory), photograph, for advertising, trade and promotional purposes in any and all media, in perpetuity, without compensation, notification or permission. Each Entrant consents to the collection, use and disclosure of his/her personal information for the purposes of this Contest and grants permission for Sponsor to disclose personal information to its related and affiliated companies, contractors and agents to assist in the Contest. 6. Grand Prize: There will be one (1) Grand Prize available to be won, consisting of a $25,000 cash prize. Without limiting the generality of the foregoing, the following general conditions apply to the Grand Prize: (i) Grand Prize must be accepted as awarded and is not transferable; (ii) upon notification, the Grand Prize winner will personally take delivery of the Grand Prize from Parker Realty Ltd. within twenty (20) days and present adequate personal identification; (iii) Grand Prize winner is solely responsible for all taxes and expenses that are not included in the Grand Prize description above, and (iv) Grand Prize winner is solely responsible for all costs not expressly described herein. 7. Selection Process: The draw date will be within 30 days of Contest closure. The Grand Prize selected entrant will be contacted by email or phone. If you have not been contacted by this date, you may assume that you are not the Grand Prize selected entrant. Before being declared the winner, the Grand Prize selected entrant must sign and return within ten (10) business days of notification a declaration and release prepared by Parker Realty Ltd., which, among other things: (i) confirms compliance with these Contest Rules; (ii) acknowledges acceptance of the Grand Prize as awarded and correctly answers, without assistance, a time-limited, mathematical-skill-testing question, to be administered by telephone at a pre-arranged, mutually convenient time; and (iii) releases Parker Realty Ltd. from any liability in connection with this Contest, the Grand Prize selected entrant's participation therein and/or the awarding and use/misuse of the Grand Prize or any portion thereof. If the Grand Prize selected entrant: (i) cannot be contacted by phone or email within three (3) attempts or three (3) business days of the Contest closure (whichever occurs first); (ii) there is a return of any notification as undeliverable; or (iii) fails to return the properly executed Contest documents within the specified time, then he/she will forfeit their opportunity to be the Grand Prize winner and another entry will be selected. 8. Odds of Winning: Odds of winning are dependent on the total number of entries received.